Type text Hydrotherapy treatments are booked by appointment only and are available Monday to Friday 8.30am - 7.30pm and Saturday 8.30 am - 4.30pm. Forms can be downloaded or posted on request. (Click here to download a veterinary consent form). Suitable for all dogs and recommended for dogs recovering from recent surgery. 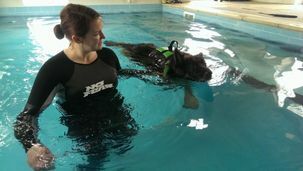 An assessment session for dogs before booking fitness or weight loss swims. A session with a Canine Hydrotherapist, which will ensure that your dog gains the maximum benefit from the treatment. Swims followed by periods of rest in the pool with massage allowing muscles and joints to benefit from the warmth and hydrostatic properties of the water. Fitness swims using the resistance jet to build stamina or in addition to a canine athletes training regime. Hydrotherapist use only. Discount: 2 dogs with the same owner £35. Not suitable for dogs recovering from recent surgery or with some medical conditions. All dogs must have a Hydrotherapy assessment treatment prior to booking this swim, see above. Owners may swim their own dog from the pool side or in the water. Note for you and your dogs safety a Canine Hydrotherapist will always be present. Please swim your dog responsibly and in accordance with our terms and conditions, and following recommendations which may be given by the Hydrotherapist. Please Note : All treatments are 30 minutes, please arrive in time for your appointment as late arrivals will still swim but will finish at the prearranged time. We will be pleased to supply the required paperwork to enable you to make a claim from your pet insurance company.